Welcome to the 38th Annual Boeing Classic Indoor Track & Field Championships on March 1 - 2, 2019, which serves as the 2019 Manitoba Indoor Age Class Championships. 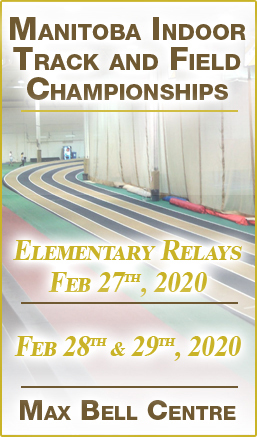 Elementary School Relays will be held on Feb 28th, 2019. We hope that all competitors will enjoy the competition in the full spirit of friendship and sportsmanship, and it is a successful meet for our local and visiting out-of-province athletes. Boeing Canada and the Organizing Committee of the Boeing Classic Indoor Track & Field Championships are proud of the quality and history of this longstanding meet and the contributions it has made to the sport of track and field in Manitoba. If parents would like prints, email is the best method of communication. With the sheer volume of photos I took I did my best to get a shot of everyone into the galleries. If a parent does not find a photo of their child, they can also reach out to me and I will go back through my photos to see if I have one.